Chapters and exercise sheets extracted from the main lecture notes (with identical content) can also be downloaded below. 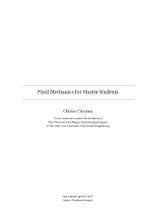 Concept of a fluid; Purpose of fluid mechanics; Important concepts in mechanics; Properties of fluids; Forces on fluids; Basic flow quantities; Four balance equations; Classification of fluid flows; Limits of fluid mechanics. Three-dimensional flow problems; The Reynolds transport theorem; Balance of mass; Balance of momentum; Balance of angular momentum; Balance of energy; Limits of integral analysis. Shear forces on walls; Shear fields in fluids; Special case: shear in simple laminar flows. 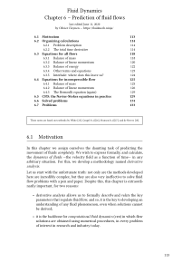 Eulerian description of fluid flow; Equations for all flows; Equations for incompressible flows (balance of mass, balance of momentum); CFD: the Navier-Stokes equations in practice. Friction-less flow in pipes; Quantifying losses in pipes; Laminar flow in pipes; Turbulent flow in pipes. Chapter 8 on turbulence is not complete yet! Check back here at the end of May 2019. Comparing influcences: the weighted momentum balance; Making models; Comparing results: force and power coefficients. The boundary layer concept; The laminar boundary layer; Transition; The turbulent boundary layer; Separation. 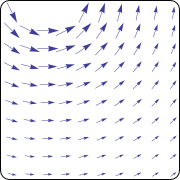 Flow at large scales; Plotting velocity with functions; Flow at very small scales. Here are archives for the 2018 exam. The exam briefing for 2019 will be on May 23rd.